The PIco FAN Kit is an Advanced Active Cooling System for the Raspberry Pi ® that can be easy installed on the UPS PIco. It is suitable for all Raspberry Pi® users whose board reaches a high temperature, for whatever reason. There is no need for any additional cabling or Power Supply, as the PIco FAN is directly powered and controlled via UPS PIco supervising circuits. A small hand work is needed in order to install the PIco FAN, solder an additional temperature sensor, as also the connector for the PIco FAN to the UPS PIco board. All required parts are included in the kit. 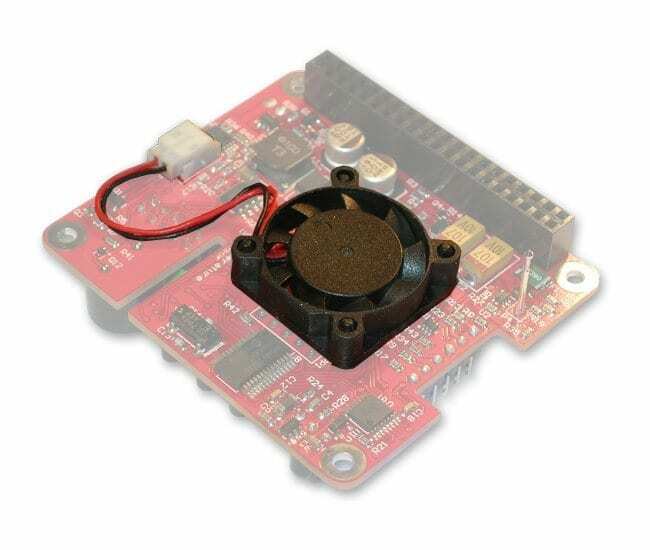 The PIco FAN Kit is equipped with an embedded temperature measurement system that continuously checks the Raspberry Pi® PCB temperature with a dedicated sensor and, according to the measured temperature, the micro controller starts, stops, or regulates the rotational speed of the embedded micro-fan. Thanks to the Special Air Distribution Slots on the UPS PIco PCB , the PIco FAN cools not only the microprocessor on the Raspberry Pi® board but all the heat-generating devices, as well as the whole Raspberry Pi PCB and UPS PIco. The embedded microcontroller is easily accessible by the user through the I2C interface and allows reading of the measured temperature, setting of temperature threshold, as well as starting/stopping the embedded micro fan. The PIco FAN in ultra low noise.